Water quality is an important factor in the health of the Axolotl. They are forgiving animals, but the correct care of axolotls in captivity is only possible under the right water conditions. Coupled with water conditions, we must also exercise caution when considering what to put in the water, be it ornaments or other tank mates. Here are the best three words of advice regarding other tank inmates: Just say no. Why? Well, let us suppose we would like to keep something with our axolotls, for instance, a fish, or another salamander or newt. The fish will invariably attempt to nibble on an axolotl's gills. After all, they're so attractive and feathery! The salamander or newt may try the same trick, particularly at feeding time. Let us suppose that our axolotl is bigger than the fish or salamander. It's quite likely we'll end up with one well fed axolotl! There is a simple rule that axolotls follow: if it moves and it's smaller than our axolotl, it'll end up in our axolotl's stomach. So, follow my three words of advice: Just say no! Young axolotls, less than 8 cm in length (3 inches), shouldn't be kept together in a confined space. If they are to be kept together, it would be wise to use an aquarium that allows them plenty of space. Young axolotls will nip each other's feet and gills, more so when very young. Even axolotls up to 15 or 16 cm (6 inches) may nip their tank mates, occasionally inflicting serious damage. This is particularly noticeable in wild type axolotls, since they are naturally more aggressive than homozygous colour mutants, and wild types will bite colour mutants in preference to other wild types. This behaviour is frequently observed by scientists and hobbyists alike and has yet to be fully explained. Cannibalistic tendencies are much reduced in adult axolotls. However adults will predate upon considerably smaller axolotls, so keep different generations apart until they all reach adulthood. Lastly, consider keeping the sexes apart, unless you are prepared to deal with the occasional batch of eggs. If you've been reading the pages in sequence, you will have read on the Housing Page that the optimum temperature for axolotls is between about 16 °C and 18 °C (60-64 °F). Lower temperatures lead to sluggish behaviour, slower metabolism, and decreased appetite. Axolotls do not hibernate, so it is not helpful to cool them below 10 °C, although they shouldn't suffer unduly if kept at these lower temperatures. Some hobbyists in temperate regions maintain axolotls in outdoor ponds. These ponds may even ice over during the winter. Provided the winter isn't particularly harsh or long, axolotls can do quite well under outdoor conditions. Obviously, a food source must be present during the rest of the year. Temperatures above 24 °C (75 °F) are very stressful to axolotls. Such temperatures cause metabolism to increase (the rate at which the body "works"), and consequently, an increase in appetite. However, the stress resulting from more than a day or two of exposure to these temperatures will quickly lead to disease and death. You can read more about axolotl diseases and their treatment on the Health Page. 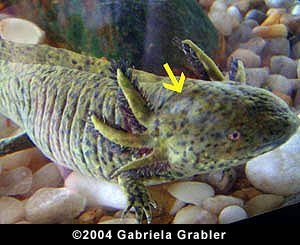 The first symptoms of heat stress in axolotls include refusal of food and/or the development of pale patches of mucus-like material on the skin (see the photo below). If you are having difficulty maintaining the temperature of your axolotl's aquarium below 24 °C (75 °F), there are a few options to consider. The easiest short-term solution is to move the aquarium to a cooler part of the home. Remember, in every room, the temperature at ground level will be at least 1-2 °C (3-5 °F) cooler than high up on a shelf. In the summer, the same rule holds true for a house as a whole: the lower rooms in the house (or the basement) will be cooler than rooms on higher floors. So, moving the aquarium may easily allow you to reduce the temperature in your axolotl tank from 26 °C to 23 °C. Such a temperature change could make the difference between your axolotl living and dying. Remember: if you plan to move an aquarium, make sure you remove most of the water first (just leave enough to cover the axolotl). Make sure there is a cushioned support at the destination (such as a polystyrene board), and ask someone to help you carry the aquarium. In more extreme cases, and in localities where high temperatures persist for more than a day or two at a time, you will need to take different measures. Some people use aquarium chillers (proprietary or home-made). I have no experience of chillers, but the people on the Axolotl Forum should be able to offer you appropriate advice. Another commonly used option, which should be safe to use for a week or two at a time is the "ice bottle". This is a plastic bottle of water, such as the 2 litre bottle (4 pints) used for carbonated soft drinks. The bottle is filled to between 80 and 90% capacity, and then frozen solid. Using a plastic bottle is important - a water-filled glass bottle will explode in the freezer. The bottle is then floated in the aquarium and the temperature monitored, and if necessary, the bottles are operated in relays. Larger aquariums would do better with larger bottles (2 L is a maximum though), smaller aquariums would do better with 500 mL bottles (about a pint). Using ice bottles safely is a skill: if the temperature changes too much, too rapidly, it can be more stressful to the axolotls than maintaining a stable, if high, temperature. Typically, ice bottles cause the temperature to crash into the teens Celsius (50s to early 60s °F). After thawing, the temperature will begin to climb back into the mid-to-late 20s once again. Then, if we put another ice bottle back in to the aquarium, the process repeats itself. This is a fast and effective method to kill an axolotl. This is because the temperature changes so rapidly and does so repeatedly, stressing the axolotls to the extreme. So, if you intend to use ice bottles, do so carefully. Do not use them on very small tanks (under 60 cm/24 inches in the longest dimension). For a larger tank, using several smaller bottles in succession is probably safer than one large one and then another large one. And be prepared to switch bottles before the first one thaws out completely so that you can attempt to maintain a relatively constant temperature. How rapid is the temperature change? It shouldn't take place in less than 30-60 mins. By how much does the temperature change? The larger the change, the more stress it will cause. How stable is the new temperature? Fluctuations are quite stressful. How often does the temperature change in 24 hours? If it's more than twice, you really should consider another option. There are no absolutes here. We just have to minimise the stress caused by these factors as best we can. I have a very clear opinion on temperature problems: I feel that if one can't maintain stress-free conditions for 360 of the 365 days of the year, one shouldn't keep axolotls. If your axolotl develops the pale mucus-like patches that the axolotl in the photo has developed, treat it as you would a fungal infection, but remember that treating this condition is not going to be successful if you do not do something about the temperature too. Water flow is usually caused by a filter or when you use an air pump on an aquarium. Output from a filter can cause significant flow and this is perhaps the most common cause of stress in axolotls. Excessive water flow will, sooner or later, lead to disease. The photos below depict an axolotl that has succumbed to the stress caused by excessive water flow. 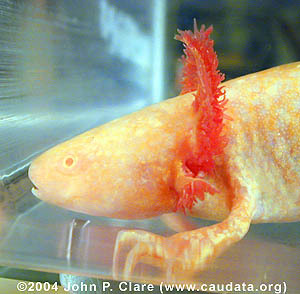 This golden albino's forward-turned gills are typical of an axolotl stressed by flowing water. A curled tail end is a sure sign of a stressed axolotl. If the filter has a built-in facility to reduce the flow, use it. Use a spray bar. Either make one from a piece of tubing that has had holes drilled in it, or buy a proprietary spray bar kit, the longer the better. Orientate it against the glass so that water force is lessened. An aquarium equipped with such a system is depicted and described on the Housing Page. Angle the filter so that the water flow is aimed at a glass side of the tank. Angle the filter so that the water flow is directed upwards towards the water's surface. Partially obstruct the filter's output using a piece of filter wool, or a home-made device, such as a piece of filter tube. Be careful not to obstruct the output nozzle too much, as this may cause your filter's motor and impellor to wear rapidly. Consider using a smaller or different filter. pH stands for "power of hydronium". Water (H2O) exists in a constant equilibrium with itself: H2O OH- + H+. The hydrogen ion (H+) is very small and strongly hydrated (meaning it attaches itself to another water molecule), essentially existing as the ion hydronium (H30+). pH is a convenient way of expressing the hydrogen ion concentration. In actual fact, it's the negative logarithm of the hydrogen ion concentration. The pH scale ranges from 0 to 14. A solution (i.e. water containing something else) with a pH of less than 7, is said to be acidic. A pH greater than 7 is considered basic (also known as alkaline). And a pH of exactly 7 is considered neutral, neither acidic nor basic. The further the pH is from 7, the stronger the acidity or alkalinity/basicity of the solution. You can obtain simple-to-use pH test kits from your local aquarium retailer. Most municipalities treat their water so that it is within a few degrees of pH 7 (neutral). My local water is 7.2 after treatment. For axolotls, a pH of 6.5 to around 8.0 is acceptable, but 7.4 to 7.6 is probably ideal. pH can affect the toxicity of ammonia and this is discussed below. If you have particularly acidic or basic water, you can adjust the pH using the kits sold by your local aquarium retailer, or you can basicify the water by adding salts, as described in the Water Hardness & Dissolved Salts topic, below. Chlorine is a nasty green gas, denser than air, that was used in the trenches in World War I. It was dangerous enough to kill people by reacting vigorously with lung tissue. This alarming property is used to kill bacteria in municipal water supplies around the world today, which makes the water safe for human consumption. Ammonia (some more info below) is another noxious gas, and many municipalities also add it to their water. Chloramines (NH2Cl, NHCl2, and NCl3) result from a combination of chlorine and ammonia. Unfortunately, aquatic animals are not top of the list of concerns of Municipalities. These substances make it necessary to use de-chlorinator in the water before it can be used in the aquarium. Alternatively, water can be left to stand for 24 hours or more to let the chlorine dissipate, but be aware that it takes a lot longer for chloramines to reach safe levels in water if just left to stand. De-chlorinators also remove chloramines. Most de-chlorinators also remove traces of metals such as iron, mercury, copper, lead, cadmium, and manganese. Metals may be found in water due to the pipes through which it must travel. I use Aquarium Pharmaceuticals' Stress Coat, which also contains aloe vera, a plant extract that, although slightly toxic, replaces the natural slime coat that fish have. It seems to have a similar benefit for axolotls and it's not harmful. Hagen's Amquel also contains aloe vera. Aloe vera also has a slight anti-biotic effect. Every time you change the water using tap water, be sure to treat it first for chlorine and chloramines. If for some reason you're unsure of the presence of chlorine in the water, you can obtain a chlorine test kit from your local aquarium shop. These three substances, as discussed on the Housing Page, are part of the biological filtration cycle in your aquarium. Ammonia, NH3, the main waste product produced by your axolotls, is very toxic in its unionised form (NH3 as opposed to NH4+). A low pH means a higher concentration of H+ ions, which in turn results in a higher degree of ionisation of NH3 to NH4+. Conversely, a high pH means that unionised ammonia, toxic NH3, is the main form of ammonia. What this means in English is that the higher the pH, the more toxic the ammonia. Ammonia can kill, and at a pH of 8 or more, it kills even more effectively. Water temperature can also affect its toxicity, a higher temperature resulting in a higher toxicity. Unless you're extremely proficient with maintaining aquarium systems, a periodic ammonia test is advisable. Even the most experienced hobbyist should occasionally test for ammonia. Nitrite, NO2-, is produced from ammonia by the bacterium Nitrosomonas. It is not as toxic as ammonia, but should also be tested for regularly. Again, test kits are available and should be used about as regularly as ammonia tests. Nitrate, NO3-, is the least toxic of this family of nitrogenous compounds. It is produced from nitrite by the bacterium Nitrobacter. Although it should be tested for, regular water changes and plants in the aquarium will keep the levels of nitrate in check. Although not toxic at low levels, if let build up through lack of water changes, it too can be dangerous, and high levels usually lead to blooms of algae. The degree of water hardness can be thought of as the amount of dissolved salts in the water. There are many kinds of salt apart from the one people use on their food. Some commonly encountered salts include epsom salt (MgSO4), baking/bread soda (NaHCO3), and "Low-Sodium" salt (KCl) used by people as an alternative to ordinary salt (NaCl). If you live in a hard water area, the chances are that you've seen limescale in your kettle or pipes. This is caused by the deposition of dissolved salts of calcium and magnesium on the heating element of the kettle and the inside surface of the pipes. Soft water contains little dissolved salts, while hard water contains significant amounts. There tends to be a correlation between soft water and acidic pH, and hard water and alkaline pH. This is because these minerals affect the chemical equilibrium in the water (discussed in a simple form in the pH section). Axolotls prefer somewhat hard water, and those that live in soft water will often suffer from temporary anaemia - the animal becomes pale and its gills lose their colouration for a few minutes or hours. This is not a dangerous condition but it can be prevented by supplementing the hardness of the water with added salts. Currently, I live in an area in which the water is a little on the soft side. I regularly supplement it with added salts. Laboratories use one of two types of salt mixture (each is known as a medium) in their water: Holtfreter's solution and Steinberg's solution. The ingredients and proportions used in each are detailed in the table below, together with the "recipe" I personally use. This table includes a brief version of a table found in "Developmental Biology of the Axolotl". Indiana University Axolotl Colony use a modified Holtfreter's solution which leaves out the NaHCO3 and uses MgSO4 in the same weight. Typically, 40% or 50% is used for adults, and 20% for embryos. I have also used another modified Holtfreter's mix at 50% concentration. The modification is that I added MgSO4 in the same weight as NaHCO3 instead of replacing NaHCO3 as done by Indiana University Axolotl Colony. As a more practical straight-forward alternative to making up your own solutions, you can purchase kits for adjusting the hardness of water at your local aquarium outlet (they also directly adjust pH and are sold as such). If you want to get the salts for the solutions mentioned above and you have problems finding them, I have seen them at the Chemistry Store, though I have never purchased anything from that company. To sum up, water conditions are an important consideration when keeping axolotls. Remember to regularly replace 20% of the water each week. Depending on the size of the aquarium or container, and whether or not it is filtered, these changes may need to be more or less frequent. Do occasionally test the water for its different constituents and pollutants. Taking care of water conditions will help to prevent disease outbreaks. It will also keep your axolotls healthy and comfortable, and it will encourage breeding.